While these might look like ordinary pieces of wooden furniture at first sight, upon closer inspection you'll notice they're actually made from cardboard. They're made by French artist and designer Emilie Mazeau-Langlais , who creates amazing furniture pieces out of cheap materials and makes them look incredibly similar to their wooden counterparts. The designer creates lamps, chairs, tables, and bookcases out of easily found and affordable materials. By bending, cutting and liquidizing the material to obtain a desired shape, Emilie Mazeau-Langlais creates cardboard furniture pieces that have an antiquated look. Her ultra-light and cheap version of a classic Louis XV commode looks both authentic and beautiful. The pieces are covered with beeswax coating; an old-fashioned finish that ensures longevity. 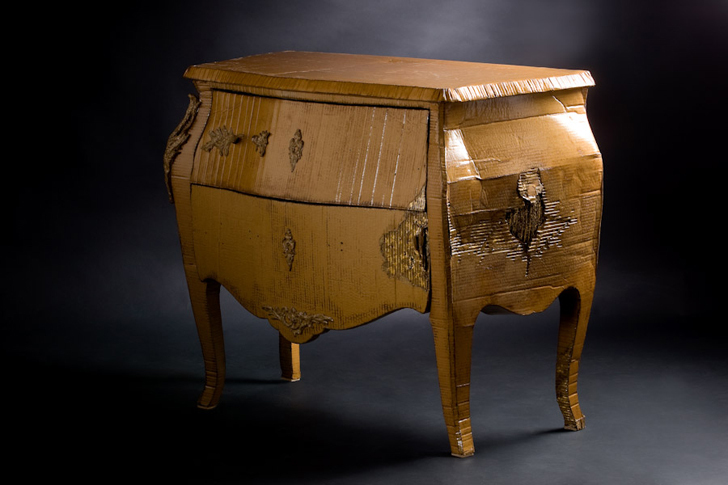 Emilie Mazeau-Langlais won first prize at the Départemental des Métiers d’Art Fair in 2009, for her Louis XV commode. Her other works include an S-shaped sofa-style seat, modular bookcase, coffee tables and different style commodes. By bending, cutting and liquidizing the material to obtain a desired shape, Emilie Mazeau-Langlais creates cardboard furniture pieces that have an antiquated look. Her ultra-light and cheap version of a classic Louis XV commode looks both authentic and beautiful. The pieces are covered with beeswax coating; an old-fashioned finish that ensures longevity. 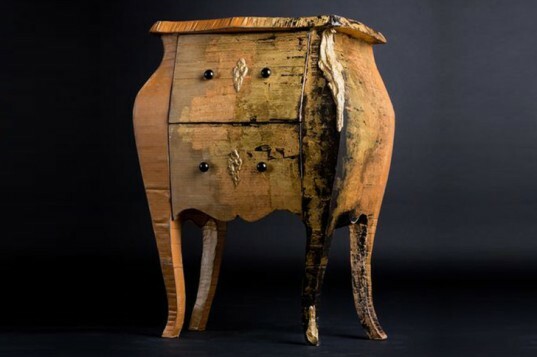 Emilie Mazeau-Langlais won first prize at the Départemental des Métiers d’Art Fair in 2009, for her Louis XV commode. Her other works include an s-shaped sofa-style seat, modular bookcase, coffee tables and different style commodes. The designer creates lamps, chairs, tables and bookcases out of easily found and affordable materials.